33 Degrees South - Gonubie Accommodation. 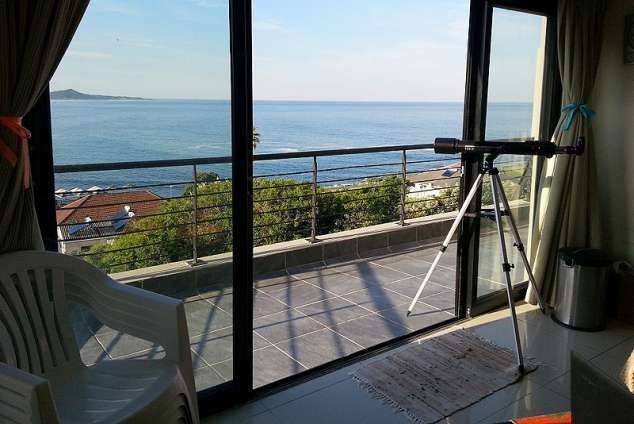 33 Degrees is an upmarket self-catering apartment situated in a newly built complex overlooking the Gonubie beachfront. The duplex offers two private bedrooms each with a queen size bed, full en-suite bathroom and adjoining lounge area. The downstairs lounge area is open plan with a fully equipped kitchenette and a breakfast bar which leads onto a patio overlooking the sea and Gonubie River. Sorry, no smoking or pets. Minimum 3 night stay. Serviced only for stays exceeding 7 nights. Gonubie is a popular holiday destination situated only 8km off the main East London/ Durban N2 route, and twenty minutes from the city of East London. Things are relaxed here and letting go of tension is easy when the beach and lagoon, with a beautiful tidal pool and wooden walkway offer hours of tranquillity and sunshine pleasure. The apartment overlooks the beautiful swimming beach and river which offers excellent bathing, fishing, surfing and walking, within 100m. Shelly's Coffee Shop is situated just around the corner and offers excellent meals daily from 08h00 - 16h00. 26737 page views since 11 Dec, 2009.